British guitarist Louise Southwood’s career began at an early age with many competitive successes and concerts throughout the UK. Her musical world was opened up under the mentorship of the eminent guitarist Carlos Bonell, described as “one of the great communicators of the guitar world”. Under Carlos’ guidance Louise’s playing blossomed leading her to the prestigious Royal College of Music in London from which she graduated with a Bachelor of Music (honours) degree in 2000. 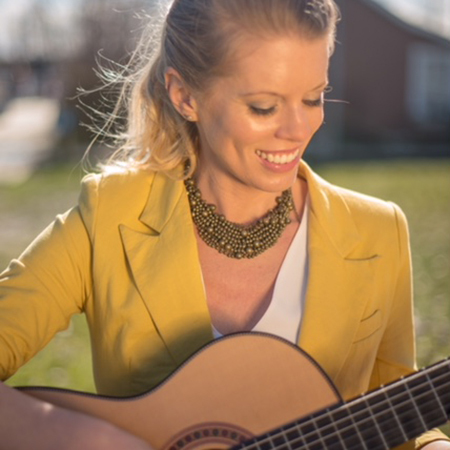 While attending the Royal College Louise had the privilege of working with one of the world’s foremost classical guitarists, Gary Ryan, on solo performance and guitar accompaniment as well as master classes with some of the world’s most renowned guitarists. Numerous engagements within the UK were highlighted by appearances at the Trinity Chapel in Cambridge, the National Gallery and St. Martin in the Fields. Following a number of years teaching at several prominent private schools and performing in London, Louise accepted a position at the Bermuda School of Music where she spent seven years teaching, performing solo and as part of the ‘Southwood-France Duo’ with acclaimed violinist and educator David France. Together they performed regularly at The Bermuda International Guitar Festival and opened The Kodaikanal International Guitar Festival 2009 in India. Louise’s most recent recordings, ‘Emergence’ and ‘Chrysalis’ illustrate her varied instrumental techniques and musical interests, with a selection of favourite pieces, ancient and modern, which have enchanted audiences around the world. Louise is now settled in the Vancouver area where she teaches at the VSO School of Music while maintaining a full performing schedule.